We have birthday season in my home: my husband is September 14 and our three sons are October 5, October 6, November 7. For the first stretch of parenting, we threw one combined birthday party for our kids the week before Halloween. Once that got to be too chaotic and our oldest began to express a desire to have an individual celebration, we transitioned to a low-key birthday party at home for each son. We’ve been doing that for awhile now. 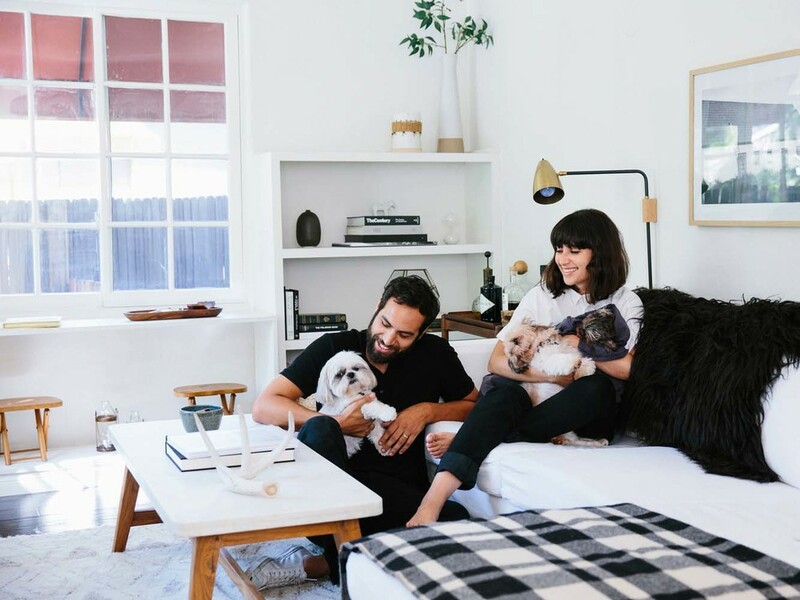 Earlier this year we moved rental homes and it wiped out my energy reserves. Soon after the move, I was looking at the calendar for the upcoming school year and noticed a curious fact: the first weekend in October was a random 4-day weekend that hit two of our kids’ birthdays. That was the moment the lightbulb went off and my brain started cranking—what an opportunity! We could go on a special trip and have it be our birthday gift to our children AND their birthday parties AND I could get out of hosting three parties. I shared the idea with my husband, he was in and was able to get the days off work. For extra fun, I kept the trip details a secret from him. First, I had to decide where to go. Mexico and Hawaii were my top contenders: Cabo, Puerto Vallarta, Sayulita, Kauai, Maui, Oahu? The kids regularly expressed a desire to go to Hawaii, so I knew that would be the most exciting to them and fulfill a dream. They often hear their friends talk about Hawaii, as it’s the most popular tropical travel destination from Silicon Valley. If I could pull off Hawaii on a budget, that would be quite the feat. I talked with knowledgeable friends, did research, and it came together. My friend owns a condo at Honua Kai Resort on Kā’anapali Beach (West Maui) and generously offered it to me half-off. It’s a ground floor unit with a patio exit, so the boys would be able to easily come and go as they please. The oceanfront resort has 3 pools, a waterslide, and 5 hot tubs—it sounded perfect for our kids who are all now confident swimmers and would delight in the freedom to roam. My first step was booking the condo so I wouldn’t lose the dates. I knew that if I couldn’t find a well-priced flight, I had some cushion time to cancel without fees. I booked direct through the owner which saved quite a bit in VRBO fees. Second, I scoured the web for flight deals. I was able to get Alaska Airlines non-stop flights from San Jose to Maui for $416 per person. This is pretty much as low as they ever go. It’s always stressful deciding when to buy airline tickets: Will they go down in price right after I purchase? Of course that’s exactly what happened. I bought the flights at $437 per person. A few hours later, I neurotically re-priced my itinerary only to discover the fare had gone down to $416. I contacted Alaska Airlines right away and they issued a refund for the price difference. Love you, Alaska Air. Third, I deliberated over whether or not to get a rental car. You can get by without one, but would it be a pain to be without a car? It’s a 40-minute drive from the airport to West Maui; the cost of a cab for my family to-and-from the airport priced out to nearly the same as a rental car. I used Southwest miles to book the car, so it was essentially free. It ended up being a very good decision to get a rental car. Finally, I unveiled the surprise and we went on the trip! We were on Maui Wednesday through Monday. I was concerned that 5 nights might feel too short for a destination that’s a 5-hour flight away, but it ended up being the perfect amount of time. 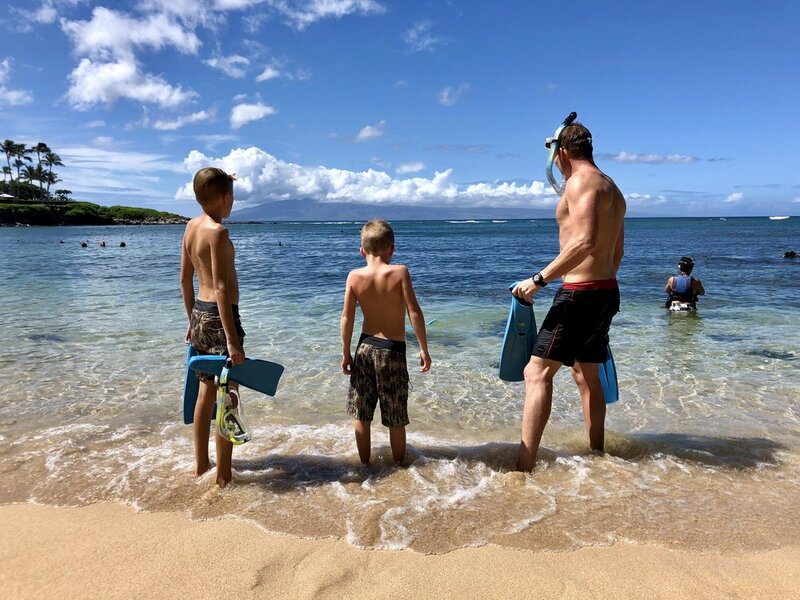 We only had 4 non-travel days, but, as my son said, “The days are long and fun in Maui.” It felt like we were there for 10 days. The kids missed 2 days of school, but it was worth it and they had no problem catching up. Last week I received an enticing offer in the mail. 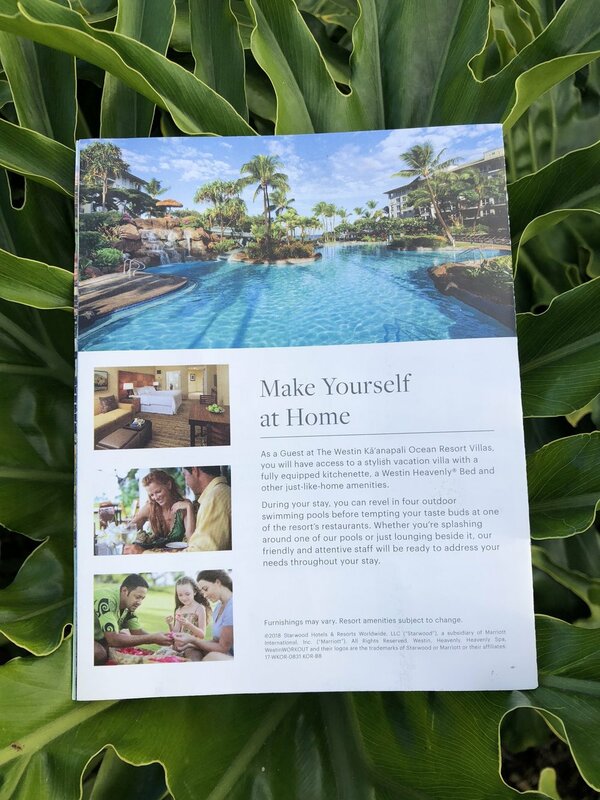 It’s a promotion for The Westin Villas in Kā’anapali. They are offering a 6-day, 5-night stay with a rental car for $698. I couldn’t believe it. I’ve been there, done that, and this is a sweet deal. You have to purchase by November 7 and you have 12 months to visit. The only catch is you have to attend a 90-minute sales presentation (no biggie). 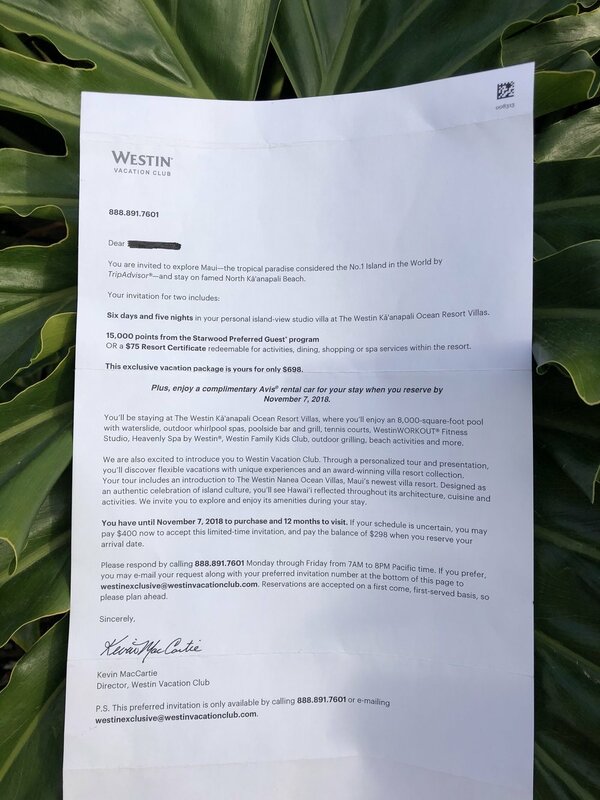 I don’t know why I received this promotion, I received a similar one this summer for The Westin in Poipu, Kauai. You might want to try emailing or calling the number to see if they’ll extend the offer to you. 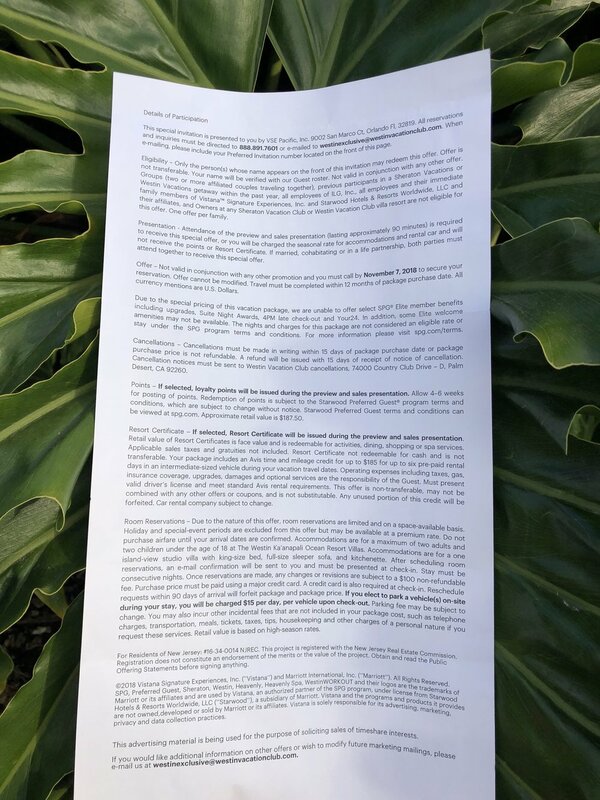 Here are photos of the letter I received, get yourself on this mailing list!